Spicy gossips and in depth news from behind the headlines, defines the National Enquirer magazine. Buy a single copy or subscription to National Enquirer magazine. With 52 breathtaking issues per year, National Enquirer is the preferred choice of everyone when it comes to sensational news items and hottest gossip. The magazine has most intriguing content with in depth investigation that is done by the special team of investigators who dig the scoops deeper to bring the scandalous truth. Apart from celebrity news and gossips, the magazine also interestingly reports crime investigations and medical breakthrough. The candid camera captures the real stars in their most natural attire. The news articles and true or false tittle-tattle would surely give you a lot to share and talk about in your friend circle. Great magazine for gossip and knowing what is going on. A very good magazine for all the gossip. Great magazine I love the gossip. 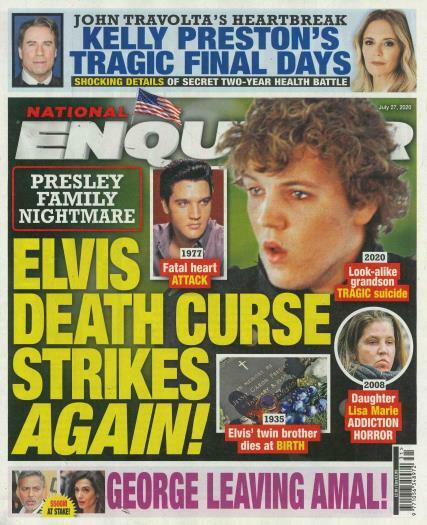 My favourite magazine for the last 20 years has been The National Enquirer. It is my guilty, secret pleasure! FulL of celebrity news (faux-news), trivia, photos and outrageous content. I wrote to the Editor once to complain about an urban myth printed as fact. He sent me a personal letter back apologising, explaining that they sometimes fill forgeign editions with stories sold to them from UK papers. It didn't put me off reading it though. I admired his honesty and I just can't resist the shocking headlines and hilarious photos. I need to know and The National Enquirer needs to tell me!